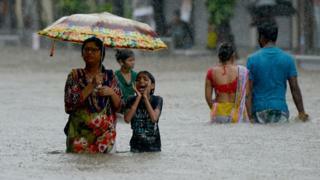 Heavy monsoon rains in Mumbai have thrown the Indian city's transport systems into chaos. Some roads have been hit by waist-deep flooding. Officials are calling on people to stay at home. More than 16 million people have been affected by seasonal floods across a swathe of South Asia, according to aid workers. Bangladesh and Nepal have been badly hit, and about 500 people have died. In Mumbai on Tuesday, trains and flights were cancelled. Schools have closed. One hospital also flooded, forcing staff to evacuate the paediatric ward. Residents took to social media to offer shelter to the stranded, or to ask for help. Many recalled the 2005 floods in and around the city, which killed more than 500 people. Weather forecasters expect more heavy rain in the next 24 hours. The BBC's Suranjana Tewari in Mumbai said the city is particularly vulnerable to floods due to construction in coastal areas, as well as waterways getting clogged by plastic garbage and an ageing drainage system. In the wider region, tens of thousands of people have been displaced. The International Federation of Red Cross and Red Crescent Societies (IFRC) called the South Asian floods one of the worst regional humanitarian crises in years.